There are 19 Assisted Living Facilities in the Bloomingdale area, with 2 in Bloomingdale and 17 nearby. The average cost of assisted living in Bloomingdale is $4,127 per month. This is higher than the national median of $3,346. Cheaper nearby regions include Glen Ellyn with an average starting cost of $3,964. To help you with your search, browse the 216 reviews below for assisted living facilities in Bloomingdale. On average, consumers rate assisted living in Bloomingdale 4.3 out of 5 stars. Better rated regions include Carol Stream with an average rating of 4.5 out of 5 stars. Caring.com has helped thousands of families find high-quality senior care. To speak with one of our Family Advisors about assisted living options and costs in Bloomingdale, call (855) 863-8283. Located about 25 miles west of Chicago, Bloomingdale is home to 22,075 people, and 19.1 percent of the population consists of seniors age 65 and over. The area includes 18 assisted living facilities (ALFs) to serve its booming senior population, including two within the Bloomingdale city limits and 16 more in nearby communities. ALFs in Bloomingdale, as in the rest of the Chicago, are regulated by the Illinois State Department of Public Health. They are designated as either sheltered care facilities or assisted living facilities, depending on the type of housing offered. All communities designated as assisted living facilities are required to offer apartment-style residences to seniors. The Chicago Transportation Authority (CTA) operates multiple public transportation options in the Bloomingdale area. The Pace fixed bus route runs throughout Bloomingdale and other nearby suburbs. Pace also offers a Dial-a-Ride paratransit bus service for those who need door-to-door transportation. Seniors can apply for a Reduced Fare Permit through the Regional Transit Authority (RTA), which can be used to pay Pace fixed-ride bus fares, Dial-a-Ride paratransit bus fares and Metra rail fares. The cost of living in Bloomingdale is quite a bit higher than state and national averages. Seniors with fixed or low incomes might have trouble finding affordable prices on groceries and healthcare services. Seniors will find Illinois a very tax-friendly state. Social Security income, pension payments, and retirement account withdrawals aren’t taxed. The Bloomingdale area is home to world-class medical facilities, including Adventist GlenOaks Hospital, in the event of medical emergencies or illness. Bloomingdale has a lower crime rate than 47% of the communities in Illinois. When compared to locations of similar size, its crime rate for violent and property crimes combined is noticeably lower than average. The Michael A. Miliotti Senior Center offers a variety of activities for seniors to enjoy including bingo games, exercise programs, and ceramics, stained glass and woodworking classes. The center also schedules overnight trips for seniors on a regular basis. Assisted Living costs in Bloomingdale start around $4,127 per month on average, while the nationwide average cost of assisted living is $4,000 per month, according to the latest figures from Genworth’s Cost of Care Survey. It’s important to note that assisted living rates in Bloomingdale and the surrounding suburbs can vary widely based on factors such as location, the level of care needed, apartment size and the types of amenities offered at each community. 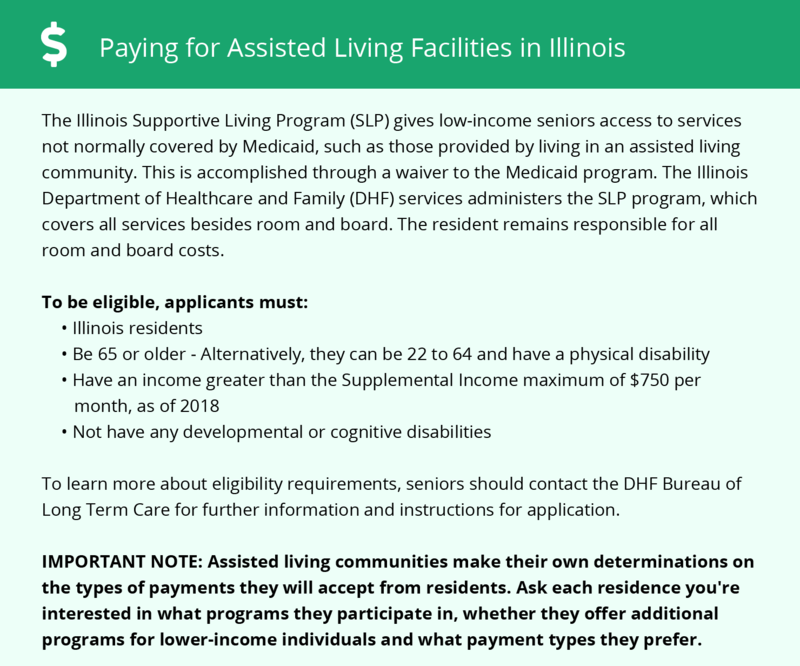 Illinois seniors who need assistance covering their assisted living costs can apply for the optional state supplement (OSS) program. To see a list of free assisted living resources in Bloomingdale, please visit our Assisted Living in Illinois page. Bloomingdale-area assisted living communities must adhere to the comprehensive set of state laws and regulations that all assisted living communities in Illinois are required to follow. Visit our Assisted Living in Illinois page for more information about these laws.